left is Geoff Black (who I understand sadly died about c.2005), dk, dk, Geoff Onyett (glasses), Graham Fells, Stephen Cook, Frank Bagshaw, John Wood, Martin Miller. Man at back not named. Photo and caption sent from John Wood Jan 2007 and updated Jan 2012. 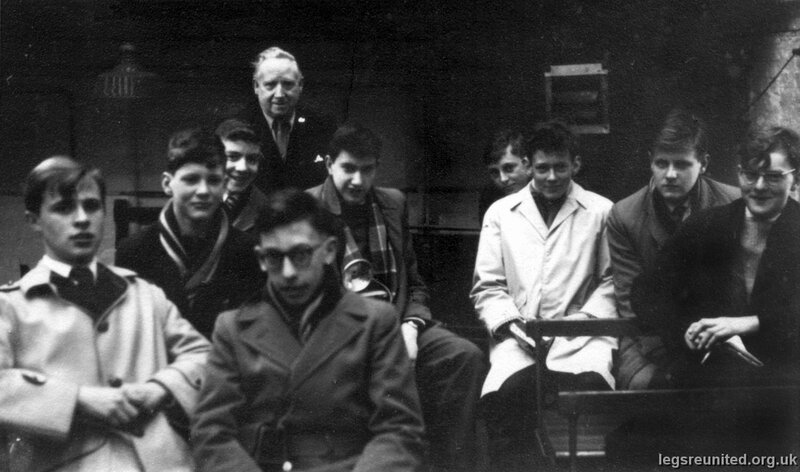 Says Keith Hodgekinson: "man at the back " is head of maths and deputy head Mr Atkinson, "Fras" and that might just be Rod Thorpe at the back in white coat, and maybe Dave Langley in glasses in front - not at all sure of these last two. A level Physics class? Says Gordon Richards The 'man at the back is not Mr. Atkinson and the boy in front with specs is not David Langley. For confirmation see slide 29 1961 at the school swimming day. Mr. Atkinson and Dave Langley are side by side and are nothing like the two on the tram. Mr A is younger than the other bloke and his hair is parted on the other side.I suggest the 'man at the back' is one of the tram staff; DL did not wear specs! !